I'm glad to be able to show off this sheet of bridge stamps because maybe now I can actually bear to part with them. 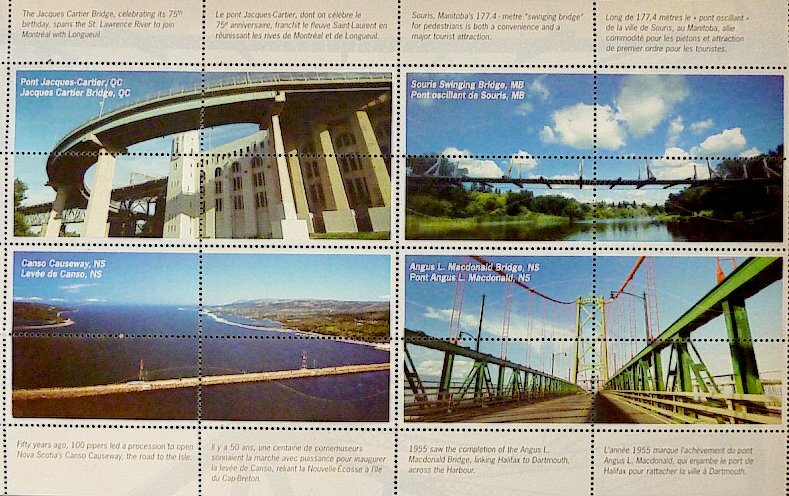 According to the Stamp Details magazine, they "add up to a celebration of geometry and perspective". The sense of motion in the stamps is deliberate, designed to convey the purpose of these grand structures. "Bridges are built for people to use," says Stephen Boake, the creative designer. "While their engineering and design features are interesting, we wanted to show how people interact with these bridges every day." As a result, individuals in action appear in each of the four stamps, some more prominently than others. For example, you may look twice at the Jacques Cartier Bridge stamp before catching the driver's reflection in his rear-view mirror. "Our approach to design is collaborative," says Boake, who worked closely with the photographer Sid Tabak on this project. Photographs of each bridge were taken on site, then digitally manipulated to obtain the human perspective the team was looking for. In the case of the Jacques Cartier Bridge, a composite image was created by including the rear-view mirror from a photo taken in Toronto. The effect is simple but dramatic -- without a windshield, car hood or other evidence of a vehicle, the viewer sees the bridge through a driver's eyes. It's a very modern image for a structure that celebrates its 75th anniversary in 2005. The Jacques Cartier Bridge spans the St. Lawrence, connecting the Île de Montréal with Longueuil on the river's south shore. This well-travelled route carries more than 40 million vehicles a year. 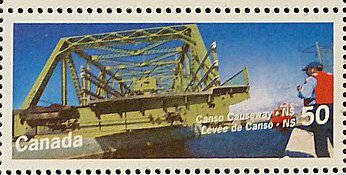 The high-speed experience of crossing the bridge is conveyed through a stamp image that's slightly askew, the horizon off its axis. "We tipped the image to add a dynamic quality, and angled the type to accentuate this sense of motion," says Boake. 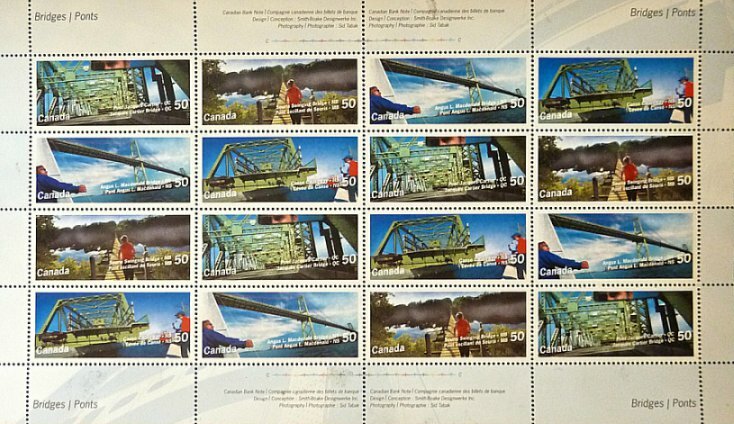 This strategy is repeated in the two stamps depicting bridges in Nova Scotia. The Angus L. Macdonald Bridge spans Halifax Harbour, linking the city of Halifax with Dartmouth on the opposite shore. Named for the provincial premier who initiated its construction, it opened 50 years ago as one of the longest suspension bridges in the world. 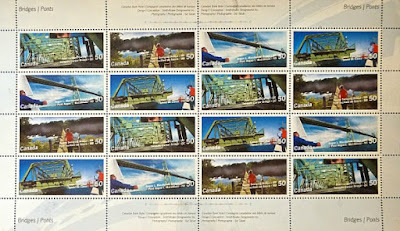 The stamp portrays this busy city and harbour with a view of the Macdonald Bridge from the deck of a sailboat passing beneath it. The converging angles of bridge, horizon and type offer a vivid sense of traffic speed and wave motion. But the image was actually assembled from an on-site shot of the bridge and a sailboat photographed elsewhere. causeway connects the Nova Scotia mainland with Cape Breton Island through a fixed link of rock built up from the ocean's floor. A swing bridge at its northern end opens to accommodate sea traffic. The stamp shows the bridge closing behind a Coast Guard ship that has just passed through, another composite image digitally assembled from two different photos, both taken at the scene. But there's no digital trick to the mist hovering over the Souris River. 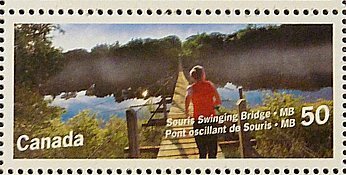 The stamp showing the Swinging Bridge in Souris, Manitoba, is based on an early morning photograph taken on the bridge, which since 1904 has provided residents across the river with a footpath to the centre of town. "We had arranged to photograph a runner on the bridge, and when we arrived, the mist was already there, with this wonderful light," says Boake. The design team accented this play of light in the image with intense colours that contribute to a sense of peaceful, early morning clarity. On the reverse side are these complementary self adhesive images of the same bridges with a brief description, in French and English. and, for a human interest story, you can check this link to a recent cat rescue from under the Jacques Cartier. Fascinating set - and interesting about the angles of the shots chosen. Interesting though they are, the angles would make me want to adjust the angle of the stamps to make everything straight. You'd think I could transfer that thought to my desk. A glorious set which makes me like bridges even more. Great stamps! And interesting information, I indeed didn't notice the mirror / driver's reflection in the first stamp! Heartwarming story of the cat rescue. I like how the angles of the bridge match the mirror, a beautifully inventive set of stamps, and a great celebration of bridges. I certainly wouldn't be able to part with these!